Piston Pump Systems | EGM, LLC. EGM offers both pre-packaged and custom configured piston pump systems. 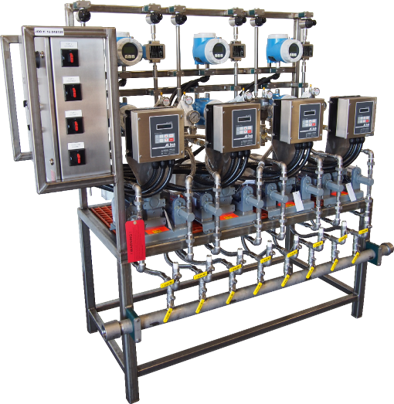 Systems can be accessorized with flowmeters, pulsation dampeners, skid enclosures, post dilution hardware, and a host of automation options to complete a turn-key system. Piping and plumbing can be configured for individual or manifolded inlet and outlet connections, and both high and low-pressure piping materials can be incorporated pending the specific details of the application. 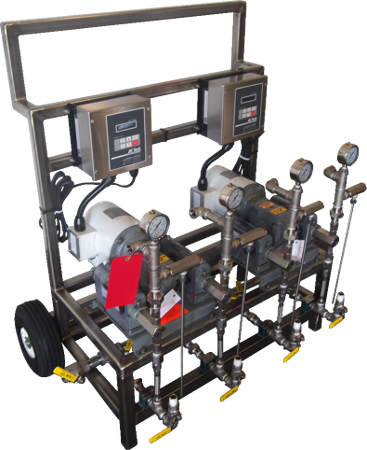 For portability, EGM offers a piston pump unit available with a wheeled base that is built for chemical trial purposes making it easy to move into and out of position for chemical evaluation. The portable system also includes 120 VAC variable frequency drives that add a simple way to add versatility in dosing by offering a motor speed adjustment in addition to the pump stroke adjustment.